Wow! You have learned many different strategies for solving systems of equations! First we started with Graphing Systems of Equations. 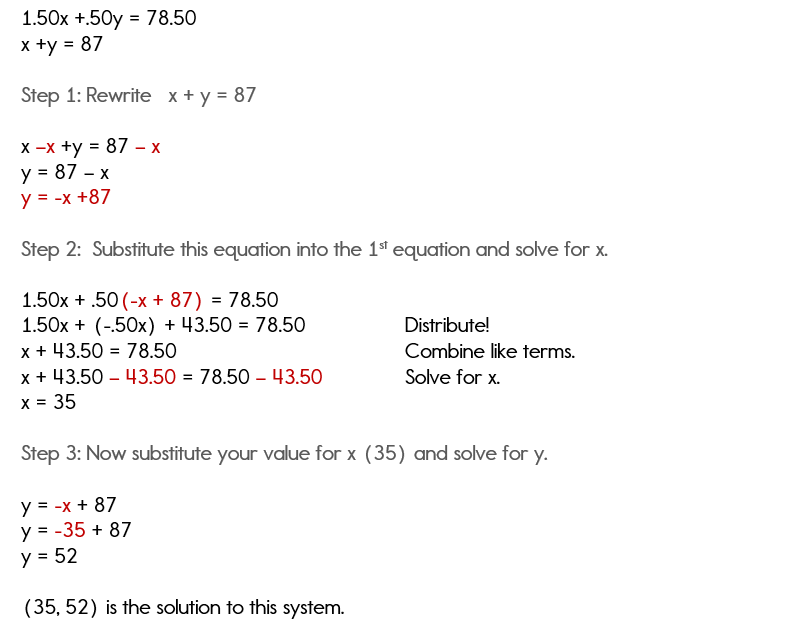 Then we moved onto solving systems using the Substitution Method. In our last lesson we used the Linear Combinations or Addition Method to solve systems of equations. Now we are ready to apply these strategies to solve real world problems! Are you ready? First let's look at some guidelines for solving real world problems and then we'll look at a few examples. Highlight the important information in the problem that will help write two equations. 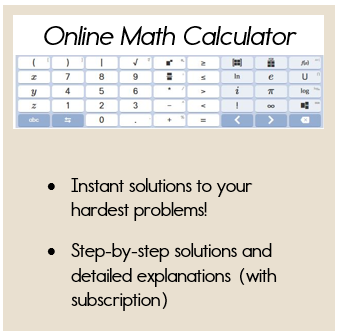 Use one of the methods for solving systems of equations to solve. Check your answers by substituting your ordered pair into the original equations. Answer the questions in the real world problems. Always write your answer in complete sentences! You are running a concession stand at a basketball game. You are selling hot dogs and sodas. Each hot dog costs $1.50 and each soda costs $0.50. At the end of the night you made a total of $78.50. You sold a total of 87 hot dogs and sodas combined. You must report the number of hot dogs sold and the number of sodas sold. How many hot dogs were sold and how many sodas were sold? Ask yourself, "What am I trying to solve for? What don't I know? In this problem, I don't know how many hot dogs or sodas were sold. So this is what each variable will stand for. (Usually the question at the end will give you this information). One equation will be related to the price and one equation will be related to the quantity (or number) of hot dogs and sodas sold. We can choose any method that we like to solve the system of equations. 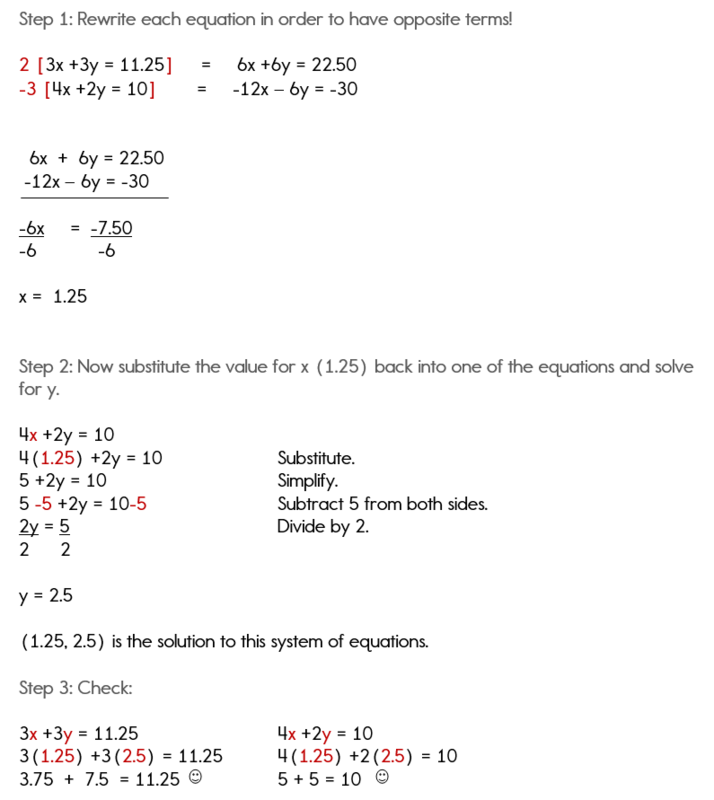 I am going to choose the substitution method since I can easily solve the 2nd equation for y. 5. Think about what this solution means. x is the number of hot dogs and x = 35. That means that 35 hot dogs were sold. y is the number of sodas and y = 52. That means that 52 sodas were sold. 6. Write your answer in a complete sentence. 35 hot dogs were sold and 52 sodas were sold. 7. Check your work by substituting. Since both equations check properly, we know that our answers are correct! That wasn't too bad, was it? The hardest part is writing the equations. From there you already know the strategies for solving. Think carefully about what's happening in the problem when trying to write the two equations. You and a friend go to Tacos Galore for lunch. You order three soft tacos and three burritos and your total bill is $11.25. Your friend's bill is $10.00 for four soft tacos and two burritos. How much do soft tacos cost? How much do burritos cost? In this problem, I don't know the price of the soft tacos or the price of the burritos. One equation will be related your lunch and one equation will be related to your friend's lunch. We can choose any method that we like to solve the system of equations. I am going to choose the combinations method. 5. Think about what the solution means in context of the problem. x = the price of 1 soft taco and x = 1.25. That means that 1 soft tacos costs $1.25. y = the price of 1 burrito and y = 2.5. That means that 1 burrito costs $2.50. Yes, I know that word problems can be intimidating, but this is the whole reason why we are learning these skills. You must be able to apply your knowledge! 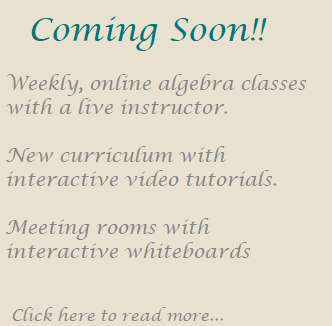 If you have difficulty with real world problems, you can find more examples and practice problems in the Algebra Class E-course. Problem about milk consumption in the U.S.
Vans and Buses? How many rode in each? How much did Alice spend on shoes? Small pitchers and large pitchers - how much will they hold?